Another season awaits, but is there a team capable of knocking Bayern Munich off their high horse? Another enthralling Bundesliga season awaits but is there a team capable of knocking Bayern Munich off their high horse? Leipzig came closest last season and Borussia Dortmund not far off but neither team showed the sort of resilience and ruthlessness capable of dethroning the Bavarians with the champions claiming the title for a fifth straight season with 15 points ahead. Let’s find out what we can expect from round one! We kick start the 2017/18 season off at the Allianz Arena with champions Bayern Munich taking on Bayer Leverkusen in a clash sure to keep you at the edge of your seat. The Bavarian giants raced to the Bundesliga title unbeaten on home soil last season with 13 wins and four draws from 17 matches. Bayer Leverkusen had a rather disappointing campaign with a mere 11 wins from 34 matches, finishing 12th on the standings. And their pre-season didn’t fare too well either. Back Bayern Munich on the Halftime-Fulltime Double at 13/20. Mainz and Hannover will open proceedings on Saturday. The home side had a disastrous 2016/17 campaign as they placed 15th, but pre-season would have given them a bit of hope as they remained unbeaten in their last five friendlies with three wins and two draws. Newly-promoted Hannover managed a poor five wins from 17 games on the road last season and will need a big improvement on their record away from home if they want to survive a season in the top flight. It’s won’t be cut and dry but Mainz are tipped to get up for the win. Wolfsburg claimed a 2-0 aggregate victory over 2. Bundesliga third-place finishers Eintracht Braunschweig in the play-offs, thus surviving another season in Germany’s top tier. To their misfortune, they kick-start the campaign with Dortmund coming to town. Home advantage will be a major factor for the Wolves if they are to claim a point, let alone a win, and I just can’t see that happening. Dortmund have won the last five meetings against their opponents and are tipped to build on that. Hoffenheim and Werder Bremen will lock horns in a clash that most Bundesliga fans will look forward to. The hosts remained unbeaten on their ground last term with 11 wins and six draws from 17 matches and will be determined to replicate that sort of form. Werder Bremen, on the other hand, were brilliant in the final third of the 2016/17 season and will be hopeful of building on that. 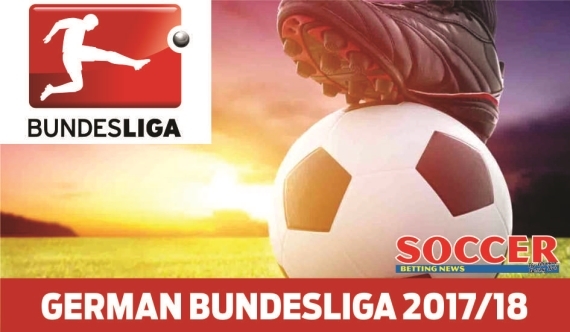 Nonetheless, Hoffenheim are tipped to capitalize on home advantage and bag maximum points in what promises to be an entertaining game of football. Hamburg hustled and bustled last season and by the skin of their teeth starved off relegation. They managed just 10 wins from 34 matches last term and come into this clash winless in their last five pre-season friendlies. Augsburg finished the 2016/17 campaign on 38 points from 34 matches, the same as their opponents. However, they did show a lot of promise during pre-season and will look to emulate that form on Saturday afternoon. Back Augsburg on the Win/Draw Double Chance at 13/20. Hertha Berlin will welcome last season’s 2. Bundesliga winners Stuttgart to the Olympiastadion on Saturday afternoon. The Old Lady were outstanding on home soil last season but failed to deliver on their travels. The newcomers were also inconsistent despite finishing top of the second tier, but will fancy their chances of upsetting the applecart. The home side won eight of their nine pre-season matches with their only defeat coming at the hands of Liverpool. The home win should be backed. Schalke and Leipzig will do battle in Saturday’s final clash of the day. The home side are unbeaten in their last 10 matches, including two league matches and eight friendlies. Leipzig were last season’s surprise packages as they finished runner-up to Bayern Munich. Both meetings between the sides were cagey affairs and I’m expecting this meeting to be none the different. I do, however, see both teams finding the back of the net. Get on the Both Teams to Score – Yes – market at 13/20. On to Sunday and there’s two matches that show plenty of promise on the betting front. Freiburg will take on Eintracht Frankfurt at the Schwarzwald-Stadion. The home side claimed an impressive 10 wins from 17 matches on their ground last term and will be determined to improve on that. Frankfurt travelled poorly with 11 losses from 17 games but will be motivated by their pre-season efforts as they remained unbeaten in their last five matches, including three wins on the spin. Both sides are expected to have a go so get on the Totals – Over 2.5 Goals – market at 21/20. We wrap up round one with an enticing contest between Monchengladbach and Cologne. The hosts finished mid-table last season after struggling to maintain winning form throughout the 2016/17 campaign. Cologne have been on fire as they come into this contest undefeated in their last 13 games, including five league matches and eight friendlies. It’s a bit of a risky call for an opening match, but the 28/10 on the away win is too tempting to pass up.